The outfit that Cara Delevingne modeled in the « British Invasion » segment of the Victoria’s Secret Fashion Show 2013 paid homage to football / soccer. Other football / soccer-inspired collections or items : Alexandre Herchcovitch Spring/Summer 2010 (this collection was influenced by football / soccer), Baptiste Viry Spring/Summer 2009 Menswear (« football / soccer player »-shaped golden buttons on some vests), Dirk Bikkembergs Spring/Summer 2004 Menswear (this collection was inspired by football / soccer ; in 2001, Dirk Bikkembergs unveiled his show at Milan’s San Siro stadium ; in 2002, footballers took to the catwalk for the designer ; in 2003, Dirk Bikkembergs designed the city outfits of the Inter Milan’s players ; in 2004, the Bikkembergs Sport line, decorated with « Il Pupino » logo, which figures a football / soccer player in a circle made of letters, was launched, in association with Umbro ; since 2005, Dirk Bikkembergs has created the uniforms of the players of the FC Fossombrone, in Italy, a club that he has bought), Dirk Bikkembergs Autumn/Winter 2004-2005 Menswear (during this show, based on sport, models were running after a ball), Dirk Bikkembergs Autumn/Winter 2008-2009 (this show set featured marble football / soccer balls), DressCamp Spring/Summer 2014 (this show featured football / soccer jersey-inspired dresses), Ebel (the « Tekton » watch, launched in September 2008, was based on a football / soccer ball), Jérôme Dreyfuss (in 2005, the « Diego » bag, dedicated to Diego Maradona, was launched), Louis Vuitton (in June 2004, to celebrate the UEFA European Football championship, in Portugal, Louis Vuitton launched the « Attacking / L’Attaquant » football / soccer bag, in its « Giant Checkerboard / Damier Géant » line ; in June 2010, to celebrate the FIFA World Cup, in South Africa, Diego Maradona, Pelé and Zinedine Zidane starred in Louis Vuitton’s institutional campaign, and Louis Vuitton produced the case for the World Cup trophy), Marithé + François Girbaud Spring/Summer 2007 Menswear (this collection, presented in 2006, to celebrate FIFA World Cup, in Germany, showcased football / soccer-inspired pieces), Mister Freedom (in the ’70s, Tommy Roberts took inspiration from football / soccer equipments for some Mister Freedom items), Siv Stoldal (some Siv Stoldal-designed pieces evoke football / soccer), Valérie Valade (for Spring 2008, Valérie Valade launched bags that were made after football / soccer balls), Y-3 Spring/Summer 2010 (the World Cup was the theme of this show, which was inspired by the movement of the net after a goal in a football / soccer match ; for the finale, Zinedine Zidane took a shot at a goal, on the catwalk, alongside Yohji Yamamoto). Furthermore, in June 2010, to celebrate the FIFA World Cup, in South Africa, the « L’Optimum » magazine asked 33 designers, including Dolce & Gabbana (Dolce & Gabbana have also produced the uniforms of the A. C. Milan, from 2004, the outfits of the Italian team for the World Cup, in 2006, in Germany, the uniforms of the Chelsea F.C. footballers, in 2010, and the « Dolce & Gabbana Lounge », at the Stamford Bridge stadium, and have also photographed football / soccer players), Jean-Charles de Castelbajac, Lanvin and Marc Jacobs, to create football / soccer outfits, as part of the « Football / soccer as seen by fashion / Le Football vu par la mode » project, which were sold to benefit Zinedine Zidane’s Ela association. 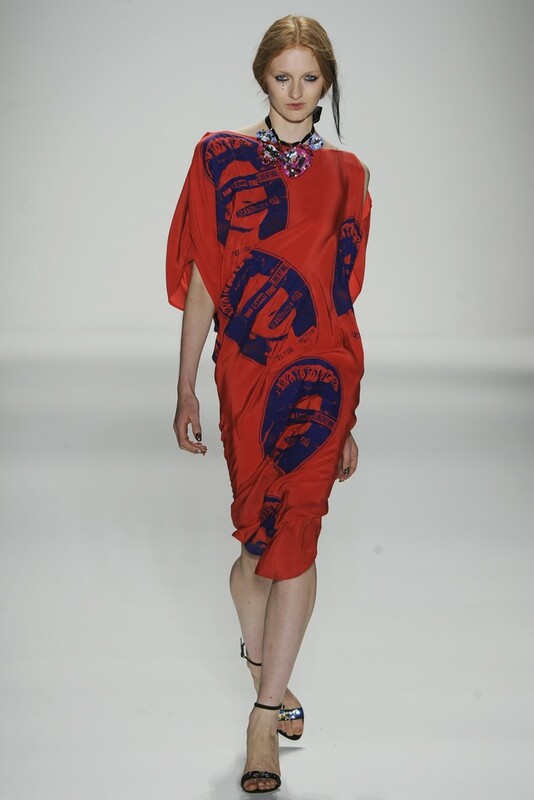 The Union Jack was referenced, with portraits of Elizabeth II, in the Alexander McQueen Autumn/Winter 2008-2009 Show. Other collections with the Union Jack : Alexander McQueen Spring/Summer 2009 (leather « Britannia » clutch, with an « Union Jack » motif, reiterated in the following seasons ; moreover, Alexander McQueen codesigned an « Union Jack » coat with David Bowie, for the singer’s 1997 « Earthling » album sleeve, and the Chivas Regal bottle that Alexander McQueen customized in 2009 had a Union Jack-cap), Alice Temperley Autumn/Winter 2010-2011 (the Union Jack was revisited on knitted dresses), Burberry by Christopher Bailey (« Union Jack » motif on a T-shirt, designed for Naomi Campbell’s « Fashion for Relief », to help the victims of the 2007 British floods), Chanel Beauty (« Pearly Banner » palette, with an « Union Jack » motif, in the « London Madness » makeup line created by Peter Philips, in May 2009), Chanel by Karl Lagerfeld Autumn/Winter 2006-2007 (leather « Classique » bag, with an « Union Jack » motif, reiterated the following seasons), Clements Ribeiro 1997 (Union Jack-sweater, in this « Punk Trousseau » collection), Comme des Garçons Spring/Summer 2006 (the Union Jack influenced several pieces in this collection, dubbed « Lost Empire »), Converse Autumn/Winter 2009-2010 (« All*Star » sneakers, dedicated to The Who, with an « Union Jack » print), Di Mauro 1944 (« The Big 4 / Les Quatre Grands » shoes, with an « Union Jack » motif, among other flags), Dior Homme by Hedi Slimane Spring/Summer 2006 (« Union Jack » necklace), Jean-Charles de Castelbajac Autumn/Winter 2006-2007 (« Union Jack » motifs on several pieces ; the « Union Jack » motif is recurrent in the collections of the designer who used to collect old flags), Jimmy Choo (the Union Jack featured, among other prints, in the Project PEP line, launched for Autumn/Winter 2009-2010), John Galliano Spring/Summer 1993 (« Union Jack » pattern on a jacket), John Galliano Autumn/Winter 1997-1998 (« Union Jack » motifs on a dress and on a black mesh top), Paul Smith for Triumph Autumn/Winter 2005-2006 (vintage Union Jack-printed boots ; the « Union Jack » motif is recurrent in Paul Smith’s collections), Vivienne Westwood Swimwear Spring/Summer 2007 (Union Jack-printed men’s swimsuits ; Vivienne Westwood also used the « Union Jack » motif to decorate the Chivas Regal whiskey bottle for Christmas 2010), Vivienne Westwood Autumn/Winter 2012-2013 (Union Jack-printed tights). Great Britain is honored in the Moschino Autumn/Winter 2013-2014 Show, which features a soundtrack dedicated to Brit Pop bands such as Blur, Oasis and The Verve. Other Great Britain-inspired collections : D&G by Dolce & Gabbana Autumn/Winter 2008-2009 (based on Elizabeth II, as seen by Stephen Frears, in his « The Queen » film), Comme des Garçons Spring/Summer 2006 (« Lost Empire » collection), Jean-Charles de Castelbajac Autumn/Winter 2006-2007, MaxMara Autumn/Winter 2011-2012 (based on life in the British countryside), Vivienne Westwood Autumn/Winter 1987-1988 (« Harris Tweed » collection, influenced by fashion when Elizabeth II was adolescent).